OSWEGO, NY â€“ At it’s meeting Monday night, the Common Council accepted a donation of trees and benches from the “Trees for Vets” program. The program has really taken off in just a few months, according to organizers Tom Galloway and Bill McCarthy. Galloway recalled how he was in another city and saw the tree lined streets. 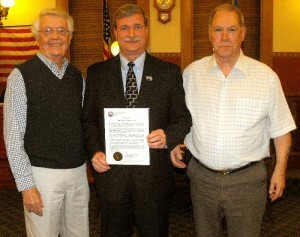 Oswego Mayor Randy Bateman presents a proclamation recognizing Tom Galloway, right,and Bill McCarthy, left, for their Trees for Vets program. “As I sat there and looked, I said, ‘Oswego used to look like this.’ And the person sitting next to me said, ‘Why the hell don’t you do something about it,'” he said. And, so the seed for the program was planted. In September 2009, the council passed a resolution recognizing the Trees for Vets program as a means to honor local veterans and to enhance the city’s opportunities to become a “Tree City USA” member. With council approval, planting of the trees will begin later this month along Bridge Street from the east city line to the west city line. In other business: The council voted 5-2 in favor of Local Law No. 1 of 2010 amending Section C 2-01 of the Charter of the city of Oswego with respect to city officers and employees. It extends the residency requirement outside the city limits for employees and city officers. “If you want to work in the city of Oswego, you better damn well live in the city of Oswego,â€ he said. The new radius includes Sterling, which is in Cayuga County, he pointed out. Since the city’s residency law was first enacted in 1993, it has been amended on numerous occasions, according to Craig Rebeor, SEIU Local 200 United chairman. Councilor Connie Cosemento pointed out that the city gives preference to city residents looking for work. â€œOne lady called me and basically said, ‘How can we, the city of Oswego, the mayor, the council, community development, advertise Oswego as a place to do business, a place to raise your families, when we canâ€™t even get our employees to want to stay here?’â€ Councilor Bill Sharkey informed the council. Sharkey and Councilor Shawn Walker voted against the proposal. James and Wilma Castiglia, owners and occupants of a single-family dwelling at 97 W. Oneida St., want to install a four-foot high split rail fence, fronting on West Eighth Street as well as West Oneida Street. Randy Zeigler, chair of Project Bloom, wants to use the city owned light poles on East First Street between East Utica and East Bridge streets to hang celebration banners as the Utica Street bridge is unavailable this year due to construction. Jesse Hill, the OARA president at Novelis wants to use Breitbeck Park on Sept. 6, starting at 9 a.m., for a Novelis Recreation Association Family Day. Scott Sugar, the Oswego City School District’s athletic director and the American Cancer Society requested to use the city bandstand, with fee waived, for the society’s Relay for Life to be held June 11 from 7 p.m. to June 12 at 7 a.m. at Wilber Field at Oswego High School. The councilors also waived quarterly water bill fees for certain residents of Hillside Avenue who have been experiencing problems with their water service. The DPW commissioner was authorized to auction off a number of items through the on-line auction services of Auctions International. The council accepted the proposal from Century 21 Galloway Realty for realtor services in connection with the sale of foreclosed commercial and residential properties. Mayor Randy Bateman was granted permission to attend the New York State Conference of Mayors and Municipal Officials to be held May 16 â€“ 18 in Saratoga Springs. Mike Dehm, police chief, was granted permission to send four officers to the Police Conference of New York to be held May 17 â€“ 20 in Buffalo. And the police chief also requested permission to send three officers to Police Training â€“ Basic Course for Police Officers to be held June 7 through Nov. 5 in Syracuse.